My couch surfing host and I had agreed to meet at a local Mexican restaurant in Oklahoma City. He said he would be there grabbing drinks with a few work friends. I arrive and look around, hoping he’ll see a young woman looking lost and guess it’s me. When no one jumps up to greet me, I begin scoping out the tables to see if anyone looks like a group of coworkers. I don’t even know what kind of work Rich does. Near the front of the restaurant is a large party sitting at pushed-together tables. There are about a dozen of them at all. They are young, attractive, white men in nice suits. They are a sea of go-getters. While one man matching this description sounds fine – even delightful – a group of them sounds like a misogynistic exercise in one upmanship. I am terrified these are the people I’ve come to meet. I try to catch the eye of a few of the men, seeing if they are the right ones, and casually-dressed 20-something fills my view. It’s my host Rich, and he takes me over to his co-workers, who in comparison to the men up front are the definition of the underdog misfits. A few more nerdy guys in the 30s and 40s, a young and ambitious-looking girl, and one short woman with an angry look on her face who doesn’t work with them anymore, but she used to. They are the IT department for a major banking and insurance corporation, and they look the part. Rich introduces the members of the group, each time giving them a somewhat insulting nickname that they hate rather than telling me their real name. “This is…uh…Kimtern.” I nod. “Because her name is Kim and she’s an intern,” he explains. “I actually figured that one out,” I tell him. He laughs. We sit for awhile, and Rich continues to make jokes. A lot of his jokes are at the expense of others, but no one has the smarts and/or courage to muster a witty retort. So he both says the most and laughs the loudest. Most of them speak so softly I can’t hear the conversation over the sounds of the restaurant. It is hilariously awkward. We head back to the house, a large home in a nice neighborhood with almost no decor. There’s a large TV, a sweet computer setup, and a stack of amazon boxes in the corner. He sets me up on an air mattress in one of the two completely empty bedrooms. It is, without a doubt, exactly what a well-paid computer programmer’s house is supposed to look like. Rich’s girlfriend is there, though she has her own place across town. The three of us watch TV for a bit, and Rich gets up to play games on the computer. I talk with Girlfriend, who eventually joins him at the multi-player. This is fine with me as I’ve got plenty of catching up to do on my computer. It gets late, and I’m ready for bed. I go back out into the living room to ask about the next day (when will they wake up, do they have an extra key, would they like to hangout at all, etc), but they are both so focused on the game they don’t notice me standing there. I go to bed, figuring we can work it out in the morning. The next day they both have to work, so I head into the city with a list of suggestions Girlfriend gave me. I visit the Cowboy Museum and take in a fancy lunch downtown which consists of organic soda and a pot pie with a fried chicken leg sticking out the top. 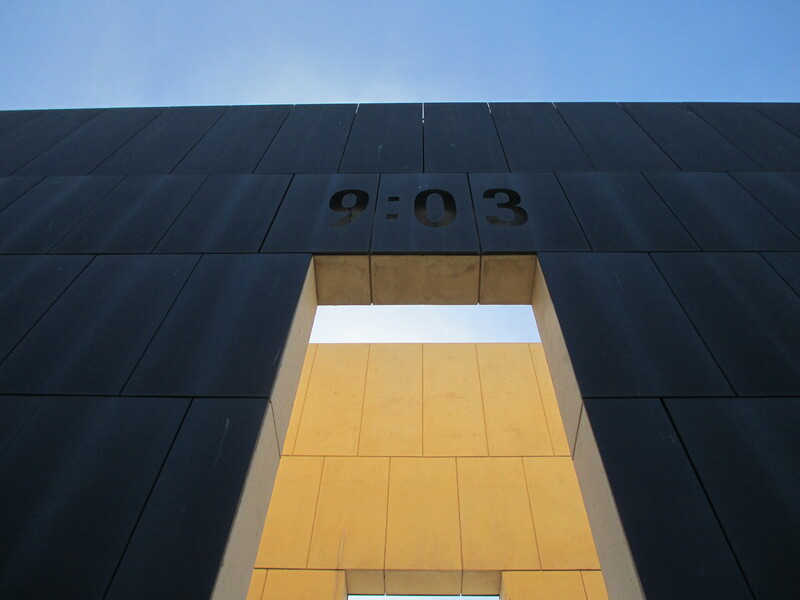 After lunch I head over to the Oklahoma City Bombing Memorial & Museum. It is one of the best museums I’ve ever visited. The exhibit starts on the third floor and you work your way down. The top floor is simple and quiet. Great attention is paid to reminding you how little terrorism, domestic or foreign, there had been in the United States prior to 1995. They show a list of every incident and I’ve only heard of one: the first World Trade Center bombing. Of course, I only heard about that after the towers fell years later. It’s true, when you think about it, that there was almost no such thing as terrorism in the real world in 1995. Only James Bond and Bruce Willis encountered terrorism. It didn’t happen to normal, ordinary people. There is a brief history on the utterly ordinary construction and use of the federal building. It’s a little simple and dull, which I realize later is intentional. It’s meant to feel dull. This is the world of a drab office building in Oklahoma. A poster explains that this is a building where people interacted with their government, as one man did when he applied for a permit to bottle and sell the water out of his private well. After I read the poster a volunteer in a chair asks if I’m ready to move on. I nod. She explains that in the next room I’ll be listening to a recording of the man’s permit hearing with the water board. I sit on a long bench in a room dressed to imply a legal office or meeting room. There’s a table and microphone set in front of a black wall. The hearing began promptly at 9:00AM, and in the recording they establish the day, time, and purpose of the meeting. They go through the names of all parties involved to indicate their presence. Once again, it is dull and ordinary. At 9:02 the bomb goes off, and the explosion is heard on the recording. The black wall flashes the faces of 168 people. The recording is still going, and the scrambled voices of everyone in the water board room layer over each other as a set of doors on the far wall pop open to reveal a room filled with light and noise and chaos. There are TVs playing footage from the day with frantic reporters explaining how little they know of the situation. This room is very different from the ones I was just in. The cases hold large pieces of destroyed concrete and decorative windows. Many of the buildings surrounding the area were damaged as well, some to the point of being razed. There is stained glass from churches. Over a pile of mismatched shoes, a single shoe is identified. It belonged to a little girl who died in the bombing. Another case holds eyeglasses, with a single pair belonging to a survivor. There is so much noise in this room, so much chaos. In the next space I see stories of individuals. One woman was in a meeting with a dozen other people. She said the bomb went off and in an instant all of the people in the room were gone. She suffered no injuries and her dress, on display at the museum, has a single tear. I move on, reading about rescue attempts and frantic parents. There was a preschool in the federal building that was completely destroyed. As I move down the timeline towards the days following and the increasingly desperate attempts to find survivors, the noise and light begin to calm. I then learn about the suspect, and the chase. Every change of subject brings a new room and a new feeling. It’s like living the whole thing with them. It’s a real gift for someone like me, who was too young at the time to understand the gravity of the situation. 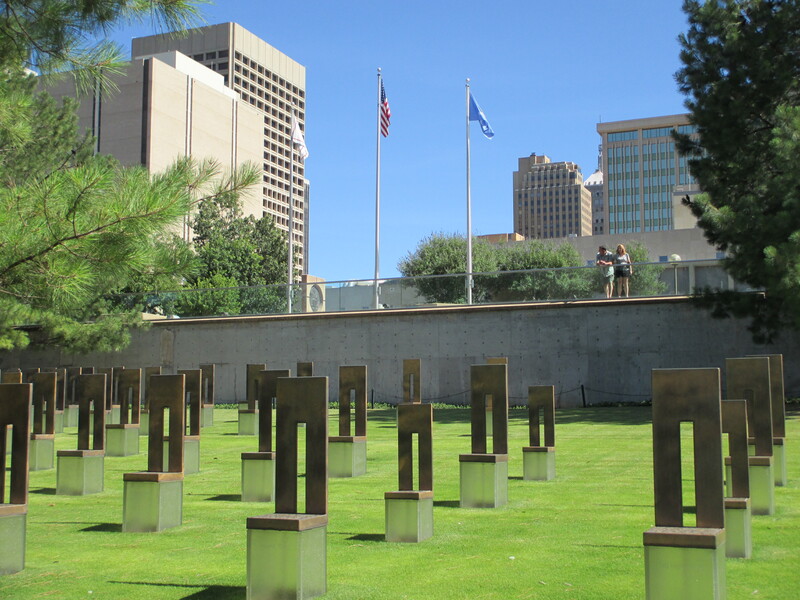 Later on in my trip I would meet a woman who lived several miles outside Oklahoma City at the time of the attack. She said she thought a truck had hit her house. She even went outside to look for the damage. Beside the museum is a poetic memorial built on the footprint of the old building and street. 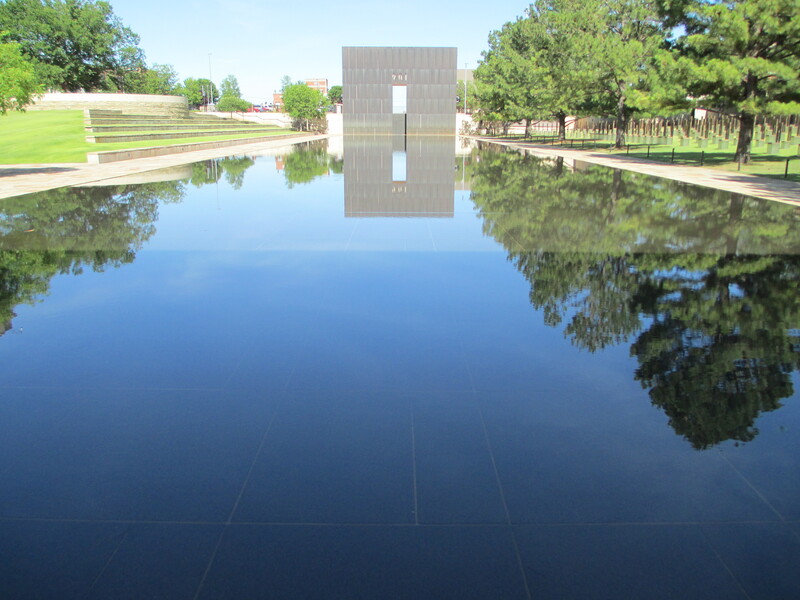 A long, black reflecting pool seems deep at first, but is barely and inch. 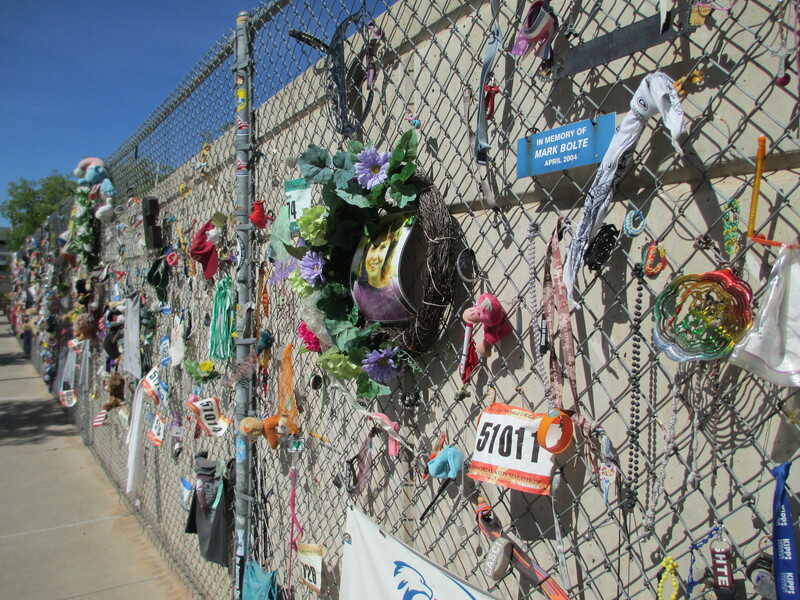 Two large doorways symbolize the before and after, and a chain link fence allows people to add their own remembrances. Over the outline of the building itself sits a field of chairs – one for each victim. The children’s chairs are small. I never knew about the children. 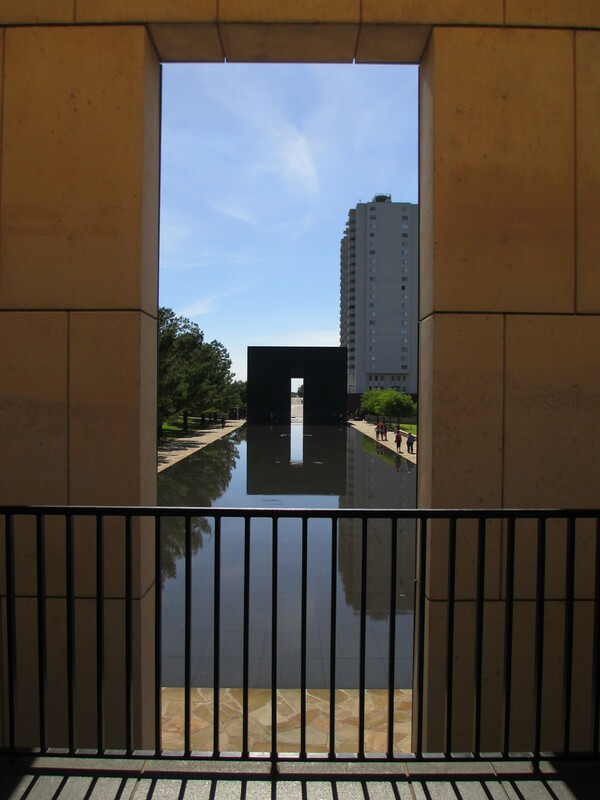 This entry was posted in Attractions, Cities and tagged memorial, museums, Oklahoma City, Oklahoma City Bombing. Bookmark the permalink.